The trek to the summit of the table mountain Mt. 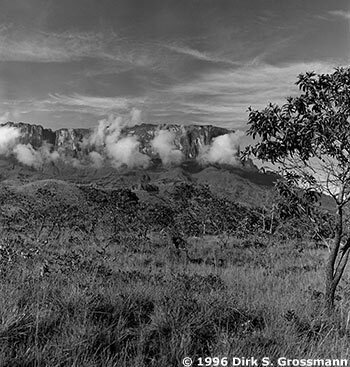 Roraima started in Paraytepui, went three days up, stayed two days on the summit plateau, and went two days down. On the first day, we went from Paraytepui through the Gran Sabana to the first camp at a creek. On the second day, we really started climbing. The way went up the erosion cone of the mountain to the second camp that was half way up. On the trek's third day, we completed the erosion cone until we reached the rock wall. Mt. Roraima's wall has a ramp that facilitates overcoming the wall. The ramp leads straight to the summit. On the summit, we stayed in the camp named "Hotel Basilio" under an overhanging rock.